Having a countertop in the kitchen is more than a trend. It offers functionality and hygiene to your kitchen. Add to that, your kitchen table will last much longer because of a countertop. If you have never bought a countertop before, picking one can be a difficult choice. The market is filled with a huge variety of them, and it can be difficult to finally settle on one. Here’s a quick rundown of all the countertops you can choose from. A marble countertop resembles pristine white color. It’s plain, simple and elegant. Marble countertops can go well with modern and classic kitchen decor. Apart from a variety of colors, you have the option to select one that is plain or has veining. However, over the years, you’ll find that light marble colors, especially white marble, can stain more easily. Wood can give your kitchen the classic feel of being in a meat shop. It’s one of the most affordable countertops you can access. However, they require more maintenance than other countertops. Water spills, and ever water rings, can leave a mark on the wood. Frequent sealing and waterproofing varnish is needed. Yet, wood countertop is perfect if you want to give your kitchen a classic feel. Solid surface is made of artificial material like corian. They are non-porous, so sealing is not required. Since they are artificial, you can find them in a wide variety of colors. Extreme temperature can cause a burn on the countertop’s surface. Soapstone is a popular alternative to marble countertops because of its softer surface. It comes in various deep-shaded colors of grey, charcoal and green tint. It needs frequent polishing to avoid cracks and scratches, but it is water-resistant, so spill away. Limestone is a common substitute for granite. You can get it in various colors. However, be prepared for constant maintenance and sealing because it is not very resistant to heat and liquids. This is definitely one of the most popular countertop materials in the market. You can find granite countertop type with all kinds of surfaces like speckled or mottled. They need sealing to resist stains, liquid and heat. Quartz is readily available, either as honed or polished sheen. The stone is quite durable, though not as much as granite. On the up side, it is easy to take care of as it is non-porous and anti-bacterial. If you’re still confused about which countertop you want to select, you need to speak to an actual person who can offer you the best information and suggestions. 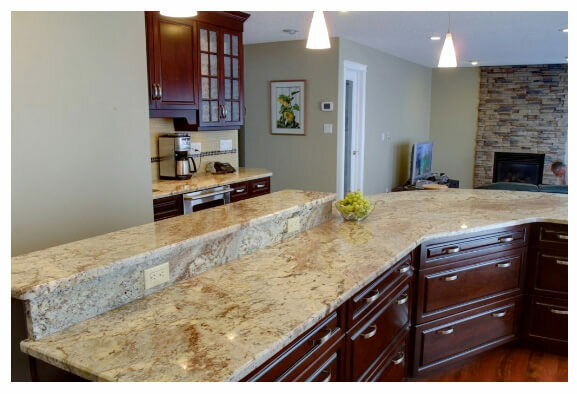 At K&J Granite in Edmonton, you can meet our professionals who will understand your requirements before giving the recommendation.